This cookie came about by trying to make one of my favorite cookies a bit healthier. I love a good cookie but many times the ingredients in a standard recipe can drive me away. The high amounts of fat and lack of whole grains is one reason why many people find themselves steering clear of cookies. This recipe packs whole grains and fiber while keeping the amount of fat to a minimum. I also add dried apricots and cranberries for a burst of flavor in each bite. 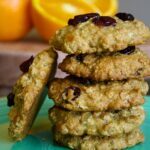 The final product won’t perfectly resemble a classic oatmeal cookie, but it is a delicious version for people who still want to enjoy a sweet treat without the guilt. A cup of coffee makes for great company alongside a couple of these cookies; they are great to enjoy for breakfast or a late morning snack. Heat oven to 350°F. Line baking sheets with silpat (silicone baking liner) or parchment paper. In a medium bowl, whisk together flours, oats, wheat bran, baking soda and salt, set aside. In a large bowl fitted with a mixer, cream together butter and sugars. Add applesauce and honey, mixing until fully incorporated. Add vanilla, orange juice and orange zest. Beat on high for 30 seconds until well mixed. Reduce speed to low and add ⅓ of the flour mixture, mix until just incorporated and continue with remaining ⅔ of the flour mixture. Scrape down sides of the bowl as needed. Add dried fruit and mix by hand to disperse evenly. Drop by rounded tablespoon onto prepared baking sheet (see above). Slightly flatten cookies to about ¼ inch thickness (these cookies don’t spread out much). Bake for 10–12 minutes or until tops being to brown. Let cookies cool 2 minutes on baking sheets, then transfer to cooling rack. Store cookies in an airtight container for up to two weeks.